(a) Put matchmarks on the rear drive shaft assembly and rear axle hub. (b) Using SST, disengage the rear drive shaft assembly from the rear differential carrier assembly. 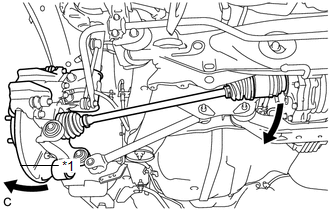 (c) Separate the rear drive shaft assembly from the rear differential carrier assembly while pushing the rear axle assembly towards the outside of the vehicle. 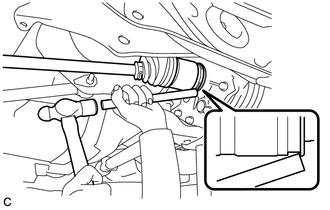 Do not disjoint inboard of the drive shaft. 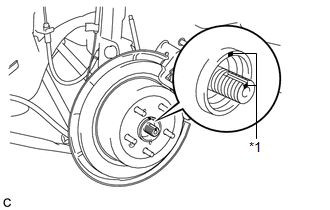 (d) Using a plastic hammer, remove the rear drive shaft assembly from the rear axle assembly. Do not drop the rear drive shaft assembly. 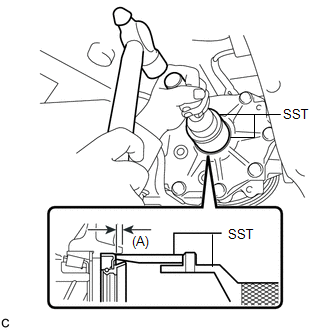 (a) Using SST, remove the rear differential side gear shaft oil seal from the differential carrier assembly. 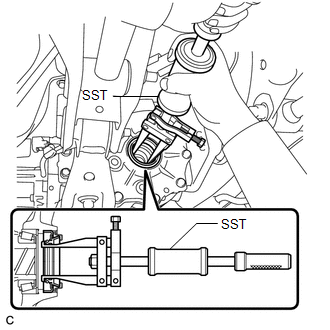 (a) Using SST and a hammer, install a new rear differential side gear shaft oil seal into the differential carrier assembly. 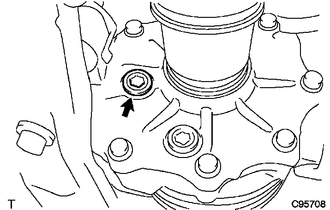 Install the rear differential side gear shaft oil seal uniformly so that it is driven in straight. 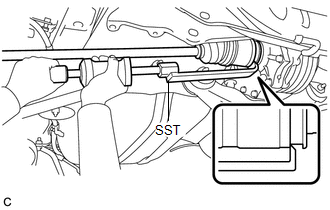 Do not excessively tap in the rear differential side gear shaft oil seal. 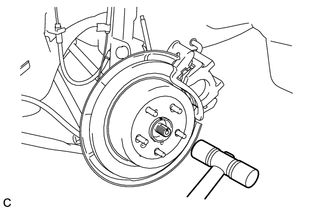 (a) Align the matchmarks and insert the rear drive shaft assembly to the rear axle assembly. (b) Insert the rear drive shaft assembly to the rear differential carrier assembly while pushing the rear axle assembly towards the outside of the vehicle. (c) Using a brass bar and a hammer, engage the rear drive shaft assembly to the rear differential carrier assembly. Set the rear drive shaft snap ring with the opening facing downward. Be careful not to damage the rear differential side gear shaft oil seal, rear drive shaft inboard joint boot and rear drive shaft dust cover. Install the rear drive shaft assembly while keeping it level.